Salonwear offers an exclusive range of lightweight and generously sized caftans. These caftans offer good protection from any kind of spillage and stains. They are specially designed to fit larger sizes. The soft and light material of these caftans is sure to make your clients super relaxed and happy during their visit to your salon. The plus size front zip caftans allow a lot of room for movement, providing maximum comfort and coverage. The fabric is easy on the body and these caftan robes fit all sizes. Women’s caftan is one of our most popular products. We also offer other salon smocks such as Barber Jacket, Big Shirt, Super Coat, Super Lab Coat, Zip Smock and many more salon apparels. Our experience in the industry has helped us develop products that are durable, easy to wear, and are made of top-quality material. Our caftan robes are made with an innovative Silkara Iridescent fabric, which is resistant to stains and chemicals. The full coverage design and long sleeves of the zip front caftan make it suitable for all sizes. Our stain resistant 100% DWR coated Iridescent Silkara fabric is 55% Polyester and 45% Nylon which ensures that you have full protection from any spills. If you are looking at caftans for sale, you will find them at Salonwear. Along with women’s caftans, we also offer products like salon capes, spa uniforms, cutting capes, barber aprons, client gowns, and many more salon smocks! 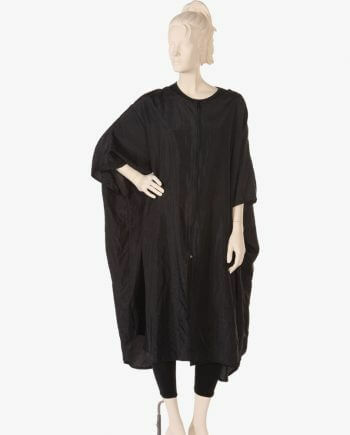 The zip caftan is available in a classic Black color. Our black caftans look extremely elegant and are found in top salons all across the country. Apart from offering you a wide range of products from salon apparels to spa uniforms and accessories, we also help you in establishing your brand. Well, how do we do this? We can customize your salon logo on the products you purchase from us. Our unique customization options are Embroidery and Screen Printing on the plus size caftans. This remarkable feature of our salon apparels and accessories is one of the many specialties that we take pride in, making us highly preferred over fellow competitors. Why Should you Choose Salonwear’s Women Caftan for Salon? We are one of the market leaders in the salon apparel industry for the last 31 years with a strong presence in the USA, making Salonwear an extremely trusted name. With our expertise and experience, you can certainly rely on us as a one-stop solution for your salon wear. We offer only superior quality products made with trendy and ingenious fabrics. You will be proud to know that most of our clients are satisfied repeat buyers because of our progressive vision and approach. We run a family business and our experience in the industry helps us know and serve our customers’ ever-increasing requirements innovatively. We assure you that by associating with us, you are bound to have a positive and fulfilling shopping experience!